Symbiotic Plankton: Providers or Parasites? Out at sea, a scientist holds a plankton sample up to the light and observes the shimmering contents. This sparkling spectacle is caused by thousands of microscopic organisms living at the sea surface, their intricate, crystalline skeletons refracting and reflecting the sunlight. These organisms, a type of plankton called acantharians, are highly abundant in all the world’s oceans and are key recyclers of carbon and other nutrients within the marine ecosystem. Acantharians are difficult to study. They do not grow in the laboratory and are so delicate and fragile that they are often destroyed during sampling. And since they are too small to be seen with the naked eye, they garner less interest from researchers than as other marine organisms, such as reef-building corals. But Margaret Brisbin, a PhD student in the Marine Biophysics Unit at the Okinawa Institute of Science and Technology Graduate University (OIST), thinks these organisms are worth a closer look. Acantharians and their symbiotic algae are too small to be seen with the naked eye, but under the microscope their beautiful shapes and structures are revealed. 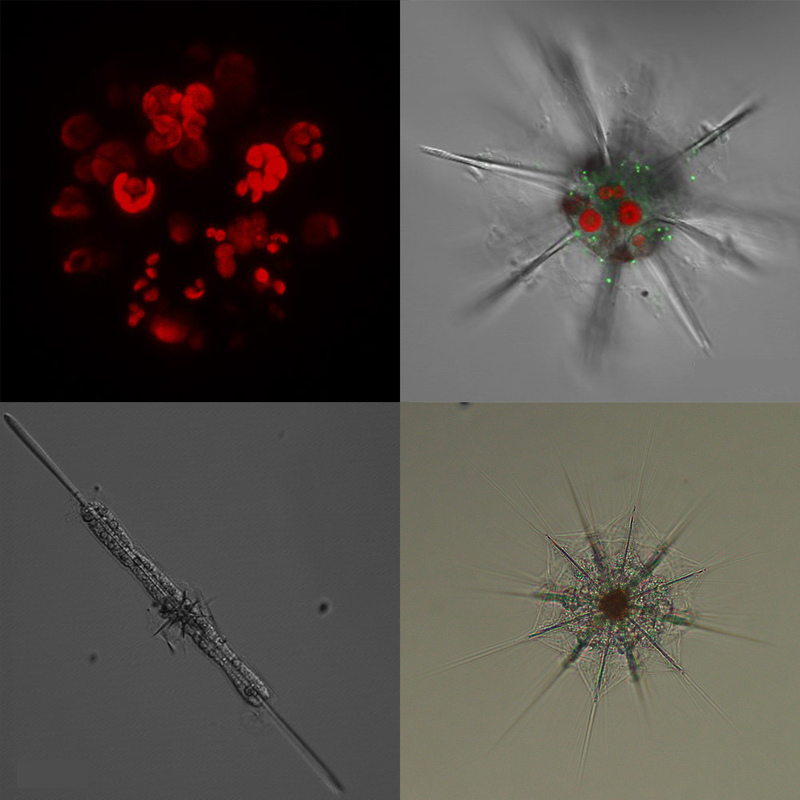 In the top two photos, the red fluorescence is the symbiont algae. In the top right, the green is the host lysosomes. Perhaps the most interesting thing about acantharians is their symbiotic relationship with the photosynthetic algae that live inside them. The algae help the plankton by providing them with organic carbon, allowing them to live in low-nutrient environments where many other organisms cannot survive. 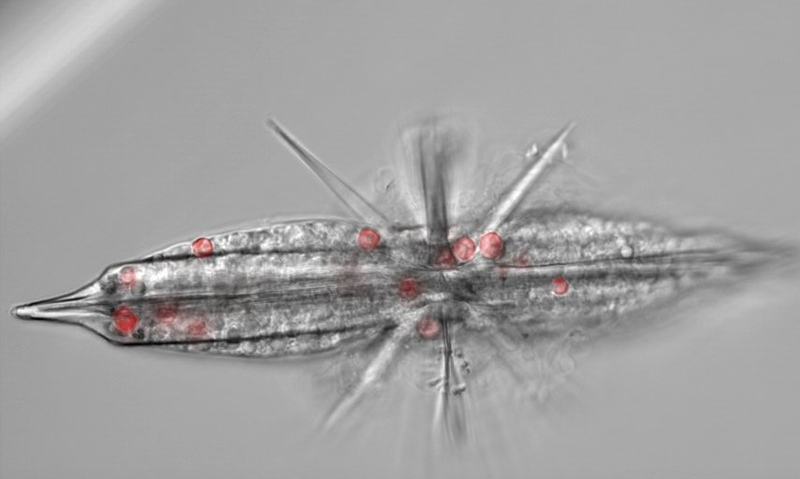 These tiny planktonic hosts and their algal partners could have a big role to play in removing carbon dioxide from the atmosphere. Symbiotic algae fix carbon dioxide at a high rate during photosynthesis, but when their hosts die their heavy strontium skeletons carry them to the bottom of the ocean, locking carbon away deep beneath the surface and keeping it out of the atmosphere. “In our present, carbon-enriched atmosphere, it is preferable, in a way, to have fast-sinking photosynthesizers,” explains Brisbin. But what, if anything, the algae gain from this symbiosis is not clear. Some biologists think that the relationship between the planktonic hosts and symbiotic algae is reverse parasitism – a kind of enslavement, where the hosts exploit the algae. However, Brisbin thinks there may be more to the story. 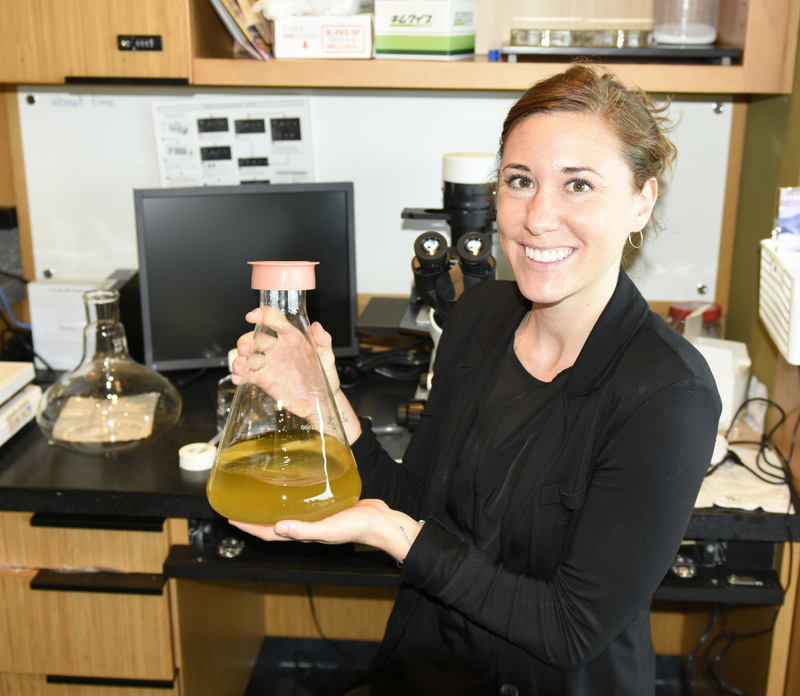 “I’m interested in finding out whether the algae are getting anything out of the relationship, or if they’re just being farmed by the plankton and digested later,” she says. Brisbin and colleagues collected samples of seawater brimming with the tiny plankton during a month-long research trip in the East China Sea. They filtered seawater through a plankton net to collect acantharians, then transferred each single host cell into a separate dish, one by one, using a glass micropipette. They also kept some seawater samples from each site so that they could compare the free-living algae in the water with the algae found inside the planktonic hosts. Margaret Brisbin, a PhD student in the Marine Biophysics Unit at OIST, holds a conical flask containing plankton. Next, they did a genetic analysis of the organisms, extracting RNA from individual host cells and sequencing a marker gene with the support from OIST’s Sequencing Section to determine the number of different types of algae within each individual acantharian host. They found that each host contains a diverse community of symbiotic algae, suggesting that the plankton hosts collect algae multiple times during their lifetime. Their findings were published in Frontiers in Microbiology. 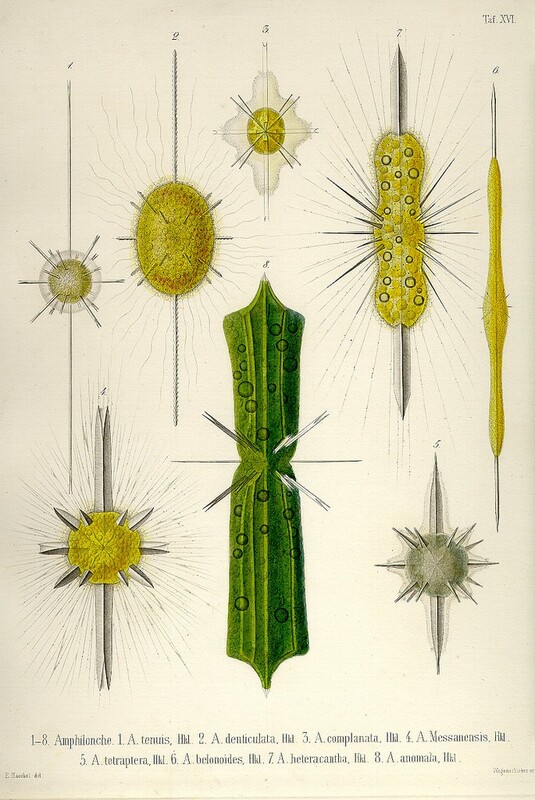 Zoological drawing showing the diversity of Acantharian planktonic hosts. The researchers also discovered that the genetic sequences of algae inside the plankton hosts differed significantly from those of algae in the seawater taken from where the plankton were found, meaning that the two populations contain different types of algae. This implies that the plankton are either choosing which specific algae to take up, or that the symbiotic algae remain inside them for extended periods of time. Confocal fluorescence microscopy on the acantharians’ digestive organelles revealed that the organisms were not digesting the algae. This is consistent with the idea that the algae are being maintained by their hosts over time. An acantharian host and its symbiotic algae, shown in red, as seen under the fluorescent confocal microscope. An extended stay within the plankton hosts may protect algae from being eaten by other organisms or shield them against viral infection. Further studies will need to explore whether the algae are truly reaping any benefits from the symbiosis, but the researchers concluded that it is at least possible that this relationship is mutualistic, rather than exploitative, as previously proposed.